As many are aware, the beer industry is massive. In fact, in the United States alone, over $111.1 billion worth of beer sells annually. Due to this statistic, one might believe that the need for ready-made beer would be at an all-time high. However, homebrewing has become more popular over the years with now 1.1 million Americans actively engaging in such. Together, American homebrewers brewed an estimated 1.4+ million barrels of beer by the end of 2017. But for those just getting into the process of making their own beer, having the proper knowledge and equipment for brewing at hand will be critical from fermenters to brew kettles. Another piece of equipment you might need is a wort chiller to quickly cool your wort after it boils. The NY Brew Supply W3850-CV is recommended for 5 to 15 gallon batches, all for a fair cost. 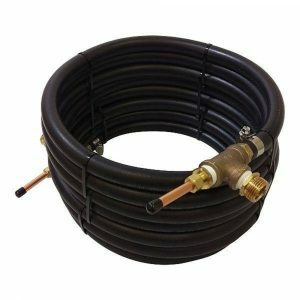 In fact, some stated in Amazon reviews that this 50 foot wort chiller is actually more affordable than some of the 25 foot models they’ve come across from different brands. Even better, the price isn’t much higher than making a beer cooler from scratch. That said, one gets great bang for their buck. But it’s not just the price of this wort cooler that should encourage you to buy this bad boy. Currently on Amazon, the NY Brew Supply W3850-CV holds an average rating of 4.9- out of 5-stars accumulated from over 90 reviewers not just due to the affordable price but also because of its remarkable function. Just as the manufacturer claims, many users find that the NY Brew Supply W3850-CV cools work quickly and efficiently. However, a complaint that often arises from consumers is that there really isn’t any packaging if you order this product online. Fortunately, many find that it gets sent to them in perfect condition, but nevertheless, if the delivery drivers in your area tend to be rough with your packages, you might want to purchase this model in store if possible. A few also claim the outlet and inlet are a bit too tight. But generally, the pros outweigh the cons. This large wort chiller gets the job done, is attractive, and isn’t overpriced. It even includes a garden hose adapter and stainless-steel clamps. Many also enjoy that this cooler is made in the USA. Perhaps the best immersion wort chiller on this list is the Northern Brewer Copperhead®. It currently has an average rating of 4.9- out of 5-stars on Amazon from 20+ reviewers. Although you can find other 25 foot wort chillers under its price range, and even 50 foot coolers at its price range, the Copperhead® still proves it has the value and quality that matches its current price point. Upon purchase, this Northern Brewer device is fully-assembled with clamps, tubing, and barbed fittings. With drop-angle connections, you can be sure that your wort won’t become contaminated as it’s cooling. You also won’t have to worry about your unit leaking with this device. Brewing at home has never been easier or more precise! Complaint-wise, consumers find that it is difficult to get wort down to 80 degrees Fahrenheit with this immersion beer cooler. Additionally, some find that this chiller takes longer to cool wort than other models they have tried. However, there are still plenty of pros. For once, the Northern Brewer Copperhead® is very lightweight even when it’s filled with water. Therefore, it is easy to transport and put away. This device is also easy to use, it stainless, and generally produces a nice brew. Chill your wort quickly with this stainless steel plate wort chiller from Blichmann. The Therminator is an incredibly compact device, making it particularly ideal for those living in tight quarters and prefer to conserve space in their home. No more worrying about a bulky metal structure as plate chillers don’t feature a coil body. 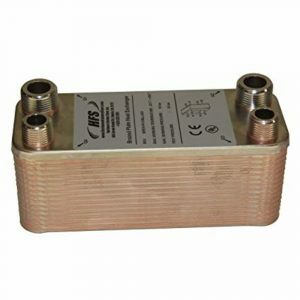 The stainless steel brazed with pure copper, the Therminator ensures heat is properly dissipated at a rapid rate without the threat of leakage. However, one big downside to the Blichmann Therminator is definitely its price. Most would probably agree. The price on Amazon is just under $200. 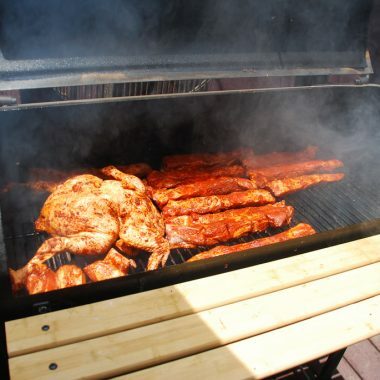 You can typically find a wort cooler of any type for at least half the cost, if not a fourth of the cost as the Therminator. But if you’re content with paying this price, know that the Therminator can be a great option considering its quality engineering, tight seal, and attractive construction. Plus, due to its compact size, the Therminator is not only easy to store, but it also easily fits into most pots, so you can boil it to sterilize it after each use. Additionally, the half-inch male fittings on this product fit essentially all types of common hose connectors. Not to mention, male NPT fittings are easier to sanitize than their female counterparts. 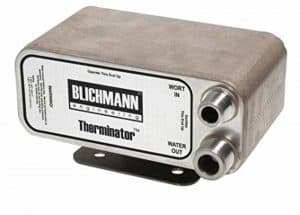 All in all, the Therminator by Blichmann might be pricey, but it features a heavy gauge mounting bracket, is easy to sterilize and clean, and doesn’t need to be gasketed. To add to the impressiveness, this chiller has the capability to chill a 10 gallon batch of wort to 68 degrees Fahrenheit in five minutes when using 58 degree water. 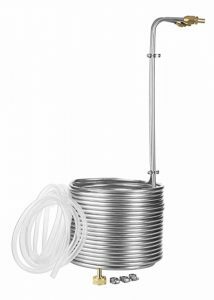 If you’re looking for the best wort chiller for 10 gallon batches, the Northern Brewer Silver Serpent is definitely it on this list. 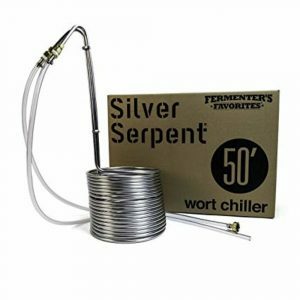 As one of the top wort chillers of 2019, the Silver Serpent might be priced higher than other similar 50 foot stainless steel options on the market, but with an average 4.9- out of 5-star rating on Amazon, it’s hard to deny this unit. According to Northern Brewer, this stainless steel beer chiller doesn’t require sanitation. Simply place this cooler in a kettle for a few minutes towards the end of the boil before the very first use and after every use. You can also be sure that this unit won’t leak during use. Additionally, the drop angle connections ensure your wort become contaminated, which means a safer, tastier brew for you. Apart from the higher price point, this unit does have a few other mentioned cons from consumers. Some mention that while it chills wort quicker than an ice bath, it isn’t the speediest beer chiller on the market. Also, a few folks had difficulty getting their wort under 80 degrees Fahrenheit with this model, as some have had with Northern Brewer’s Copperhead® as well. However, the fairly compact size, ease of clean, and quality connections between the hoses and the the product itself help make up for the higher cost. If you’re looking for a suitable chiller for 5 gallons, this NY Brew Supply 25′ unit might be a great pick. Featuring a durable outer coil that is capable of taking on high temperatures, you can be sure that it won’t become brittle as it ages. According to NY Brew Supply, the hose on this Brew Supply model is potentially more durable than standard garden hose designs. There are many good things reviewers have to say about the NY Brew Supply 25′. Many find that this model is well-priced for its quality, has little to no leaks, and easily chills wort to the appropriate temperature without hassle. All in all, this device is perhaps the best counterflow wort chiller NY Brew Supply has to offer today thanks to its phenomenal design and overall quality. While this is clearly a great buy for many, looking at the pitfalls of this unit is still crucial before purchase. The only true cons users have to mention is that some of the fittings need to be tightened for optimal performance, it sometimes gets clogged, and it takes a little longer to set up than other similar models. But being easy to use and clean, having a fast cooling time, and having brass fittings that allow you to adjust the angles and positions of the inset and outlet make this product a great buy. If you’re looking for a quality, 50 foot stainless steel beer chiller, the Jockeybox WC50SS38 is a highly-rated unit with a 4.4- out of 5-star rating on Amazon. Being stainless steel, you can ensure it will be more stable, easier to clean, and won’t corrode like a copper chiller might. This material will also not contaminate your wort, leaving you with only a clean, fresh brew. Many users of brewing coolers also state that stainless steel is a better option because it has greater longevity and generally holds up better over the years. Jockeybox claims that the WC-50SS38 is easier to use than a counterflow wort chiller and has efficient heat transfer. According to reviewers, these claims are true. This product is incredibly easy to use, even more so than an ice bath, and cools wort incredibly fast. To speed up the cooling process further, the user of this product can easily adjust the spacing of the coil. While this is a great chiller, some consumers mention that you might need to tighten the hose clamps to avoid leaks before you begin cooling wort. Without tightening the hose, the hose will expand due to heat. The extra space between the unit and the hose can easily allow room for water to enter your wort. Some also claim that the hose that comes with this unit is a little too thin. If you feel this way too, simply opt for high temperature silicone tubing that is more suitable for your needs. Other than the latter, many find that this is a reliable product that provides exactly what Jockeybox states. Another excellent piece of brewing equipment is the Home Brew Stuff WC-25 3/8 x 25′. This is a great unit if you’re on a tighter budget; it’s currently listed on Amazon for right under $50. The manufacturer of this unit argues that copper tubing is best for chillers. According to them, the thermal conductivity of copper is approximately 28 times higher. They also mention that copper is beneficial in imparting minerals into your wort to benefit the yeast. Using this unit, your wort will chill so quickly that it might even reach a temperature lower than what you had originally tried to go for. That said, there’s no time wasted with this device. Many reviewers also love that the body is quite durable, has little to no leakage, features an easily-adjustable coil, and is a breeze to clean and sanitize after use. While some reviewers claim that the connection between the water hose and copper tubing has a poor design and that the supplied clamps don’t offer the tightest seal, others find that you get exactly what you pay for, for the lower cost of the WC-25. Generally, a majority find that this unit doesn’t have a complex assembly, is simple to operate, and that getting wort under 80 degrees Fahrenheit with the WC-25 is quick and easy. 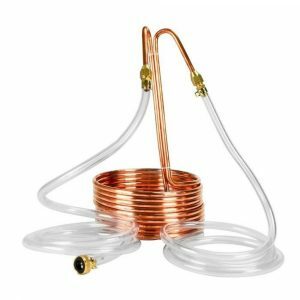 Coming to another 50 ft beer chiller, the Learn to Brew LLC Copper Coil Immersion Chiller is set at a fair price under the $100 range. The manufacturer, Learn to Brew LLC, claims that the soldered fittings on this unit will never leak or unexpectedly burst. They also mention that other immersion models that have compression fittings expand and contract as temperature changes, often leading to leaking, and thus, causing contaminated water to drip into your wort, something that soldered fittings won’t do. This immersion cooler in specific is designed for longevity and convenience. 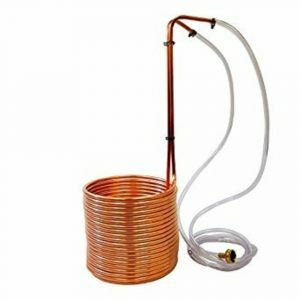 It features easily-adjustable loops, is equipped with smooth and tight hose connections, and has a price point that’s about equivalent to the price you’d spend making a copper cooler yourself from scratch. Many also applaud this copper unit for its quick ability to cool down your hot brew. Discussing the cons, there are bound to be a few considering no product on the market is perfect. Some reviewers stated they had to resolder the connections to absolutely ensure there was no leakage. Some also weren’t fond of the fact that this unit doesn’t have a rubber hose gasket on the inlet. But generally, more than half of reviewers are completely satisfied with this chiller and its ability to work quickly with smaller batches of wort. Based on this list, the Coldbreak 12.5′ is one of the top wort chillers for the money considering it’s currently priced just a penny under $40 on Amazon. For a copper chiller, the price point is phenomenal, but there’s a drawback: this compact equipment may be too small for your brewing needs. But generally, this mini 12.5 foot chiller is a great pick if you plan on chilling smaller gallon batches. It’s also a great option if you’re on a budget and want a product that is easy to store when it’s not in use. Nevertheless, brewing with this unit is far better than using an ice bath to cool down your wort. In fact, this Coldbreak device can chill one to three gallons of hot wort in less than 10 minutes. Plus, with the 3/8 inch OD copper tubing and lead-free female garden hose fitting of this product being made in the USA, you know the quality will be there. 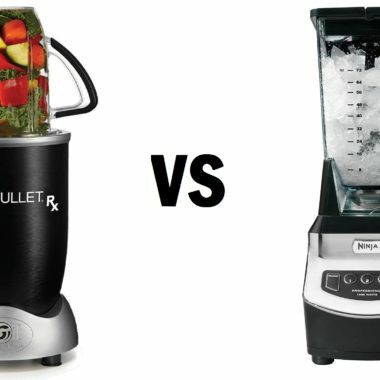 Although, know that not everything is sunshine and rainbows when it comes to beer chillers, even the higher-priced ones. Some suggest that you need to test this chiller before using to ensure it doesn’t leak; your unit might need tightening. However, this should be done for wort cooler you purchase no matter how affordable or expensive it is. Fortunately, the pros typically outweigh the cons. Apart from the great price, this unit is attractive, easy to use, and very much portable, thus is a great pick for someone new to the home brewing game. As one of the top wort coolers, the HFS(R) Homebrew currently has a well-deserved average 4.4- out of 5-star rating on Amazon. While it’s usually immersion wort chillers that are wanted by home brewers, the compact size of a plate chiller just can’t be beat. However, unless you’re hoping to avoid the bulkiness of immersion or counterflow wort chillers, don’t opt for a plate chiller if you’re not up for the longer, more tedious cleaning process. But generally, a plate chiller like this offers top-notch heat exchange all in one coil-free, simple design. As plate chillers maximize surface area, your wort will receive the quickest cooling process known to man, even quicker than the average immersion chiller. Compared to other plate chillers within a similar price range, some reviewers even go as far as to say that this model is principal. Truthfully, there aren’t a lot of cons users mention after giving this product a go. That said, the most common pros people list include the following: works very fast, no need to recirculate your wort, doesn’t leak, and works well whether you use ice water or warm ground water. To top it off, along with the purchase of this product, you’ll also receive a one-year warranty which is greatly appreciated by consumers on a broad scale. If you have yet to own a quality beer chiller, make sure to read the following frequently asked questions and answers. It’s critical to understand the purpose of these special devices, how they work, and how to maintain them to ensure they hold up well over the years. 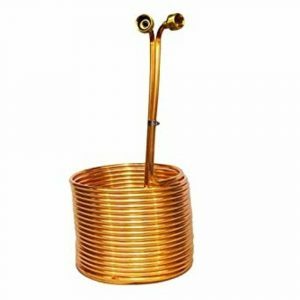 What is a wort chiller used for? These devices are used during the home brewing process. They allow homebrewers to quickly cool boiling wort. You might think, “Why do I need a chiller if I can cool my wort with an ice bath?” With a chiller, you can get the same job done with the fraction of the time. Thus, many claim they make their best wort with this piece of equipment and don’t regret purchasing one at all. Do I need a wort chiller? While not required for home brewing, they can be very convenient. For many, the perks of using a beer chiller, from better beer clarity to greater flavor of their booze, are worth the costs of owning one. Cooling wort without chillers, on the other hand, can be a longer, more tedious process. How do wort chillers work? Using a chiller is fairly easy. However, the process will vary depending on whether you have a cold plate, immersion, or counterflow chiller. Regardless of the type, each chiller utilizes a source of ice water that flows through the chiller’s steel or copper body. The water flow helps absorb heat from the wort, cooling the wort quickly. It’s important to follow the set of instructions that may have come with your chiller. There are also plenty of guides on the Internet and great YouTube videos you can reference if you’re having trouble using your specific model. What is a counterflow wort chiller? Counterflow chillers feature a tube inside a tube design. The inner tube contains hot wort from the boil kettle while the outer tube contains cold water flowing in the opposite direction. 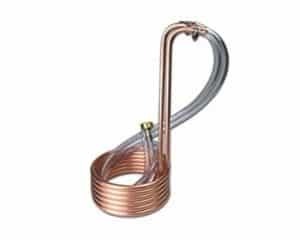 What is immersion wort chiller? Immersion chillers are exactly what they sound like. These chillers are partially submerged into the wort. 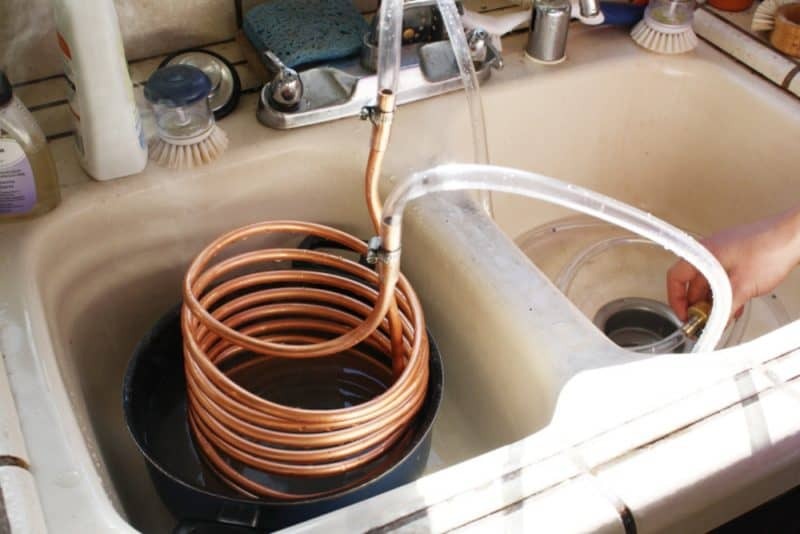 The homebrew would then attach the chiller either to their kitchen faucet or their garden hose before running a cold water source through the chiller. What is a cold plate wort chiller? If you’re looking for a compact product, a cold plate chiller might be your best bet. Like counterflow chillers, cold water and hot wort flow in opposite directions. However, their cold plate counterparts feature a rectangular body instead of a tubular coil body. What size wort chiller do I need? Size absolutely matters in this scenario. Some chillers are only capable of taking on certain sized batches. On the packaging of beer chillers, or in the listed specs if you’re purchasing online, it is often listed how many gallons of wort it is best for. However, usually 25′ x 3/8″ is standard for five gallons while 50′ x 1/2″ is most suitable for 10 gallons. How to clean wort chiller? Wort chillers are easy to clean. But the important thing is that you clean and sterilize your chiller thoroughly to prevent a tainted batch of beer. Like with the different operation of the three types of chillers, there are also different ways that they must be cleaned. Nevertheless, all chiller should be cleaned after each use, no excuses. Right after use, before the chiller has had time to dry, flush your device with a cleaning solution. To properly dislodge buildup and debris, run the solution in the opposite direction of the tubing. Flush out the chiller with clean water. Rinse the chiller with a sterilizing solution. Submerge your immersion chiller in a cleaning solution. Rinse your chiller with clean water. Soak your chiller in a sterilizing solution for a few minutes. Optional: If your immersion chiller is stainless-steel or copper, you can bake it in the oven to kill bacteria. Back-flush your plate chiller with a cleaning solution. Then back-flush your chiller with a cleaning solution in the opposite direction. Flush the chiller with water in both directions. Flush the chiller with a sterilizing solution in both directions. Optional: Biol your plate chiller in water or cleaning solution to rid of excess debris. Optional: Bake your chiller in the oven to kill bacteria that may still be present. 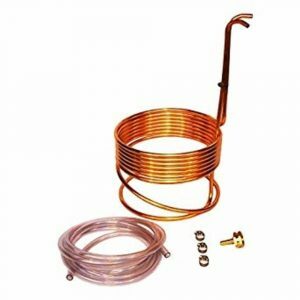 What is the best wort chiller on the market? Before even considering buying a wort cooler, it’s important to know which of the three types of chillers is best for you. For instance, if you like easy maintenance, an immersion chiller might be most applicable, and you’ll surely want to steer clear of plate chillers as they are tedious to clean compared to other beer coolers. Apart from the maintenance, the material, size, and costs of your future chiller are also critical to keep in mind as you select a good model for your needs. As you come across other wort chillers on the market, no matter how trusted the brand or how expensive the product, always be sure to look at verified reviews of the specific model to dictate if it’s the right product for you.